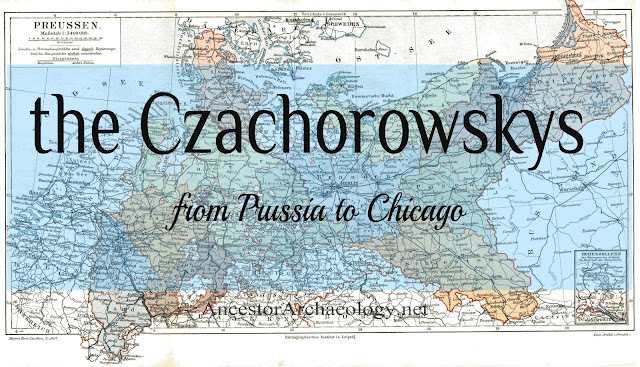 The Czachorowskys are a conundrum. They seem to simply 'appear' in Chicago around 1868. Claiming to be from Prussia I have yet to determine their actual origins. Or their point of entry into the United States. Or why they chose Chicago. As I set out to research one family I discovered others. Curiosity getting the best of me, this turned into the study of five Czachorowsky families living in Chicago c. 1870. It is my hope with this series to make some discoveries to either link these families together, or prove they are not related. This is a real-time research project, I have not worked on this cluster before. 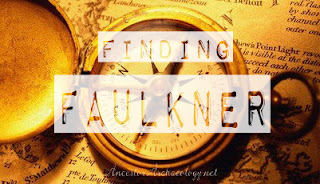 I plan to share my discoveries and my frustrations in hopes that more eyes on the evidence will result in some sound conclusions. 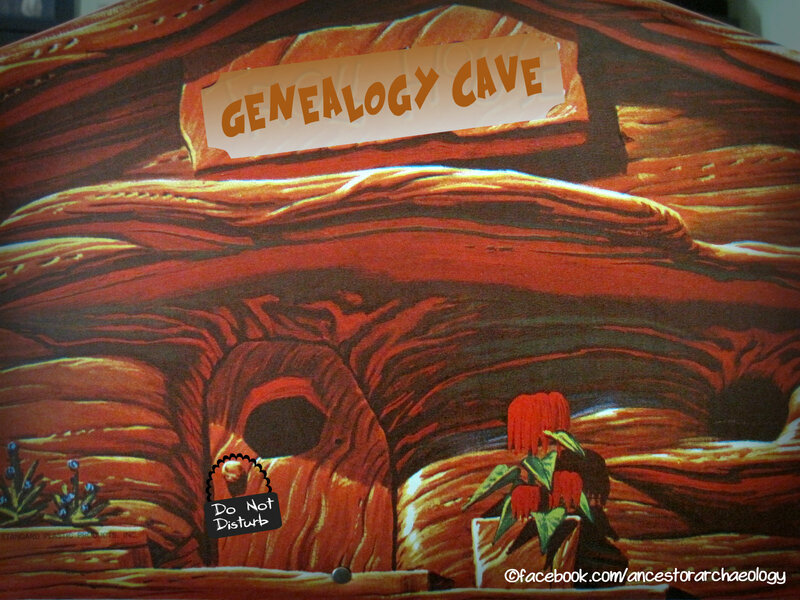 Join me as I explore these families, maybe we'll make some discoveries together! Anton first appears on a ship's list departing Hamburg, Germany. He was emigrating with his young family to America. The family consisted of Anton and his wife Maria, son Franz who was 7 1/2, daughter Paulina, aged 3, daughter Maria aged 2, and baby son Bernhard, just 3 months old! Also traveling with them were Anton's sister Paulina and an older woman named Anna Jenczynske* (maybe - really hard to read). The trip took a month. One more very important piece of information was found on this document. Can you see it? It's their residence prior to departure!!! 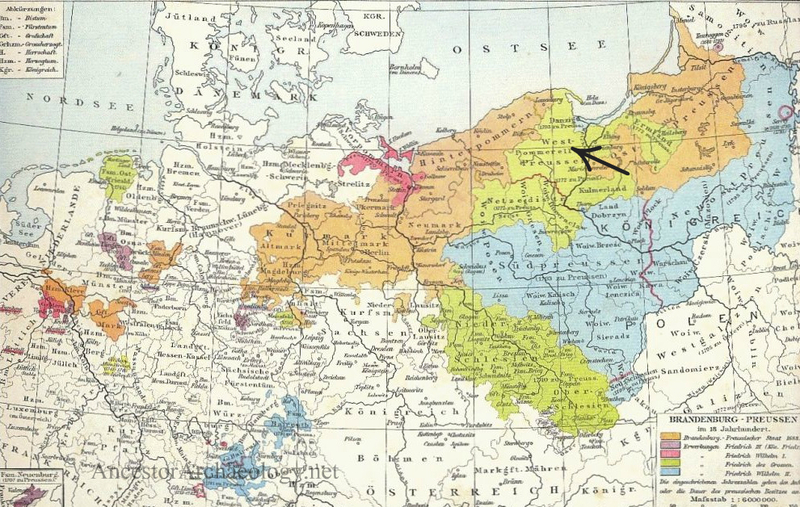 Thanks to the German Genealogy group on Facebook I was able to decipher it. 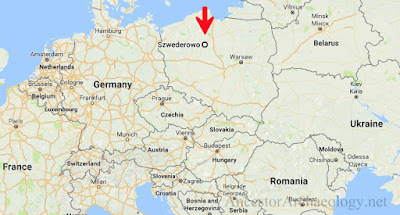 Neu Szwederowo, Prussia! We finally have a hometown for Anton! Oil painting, by J. & F. Tudgay, 1864. They traveled aboard a sailing ship named the Shakespeare - I can't even imagine. The image to the right is of a painting of that very ship. It hangs in a museum in Bremen. Below is a cut-away of life inside one of these large sailing ships. Let's just say is wasn't a Disney cruise! 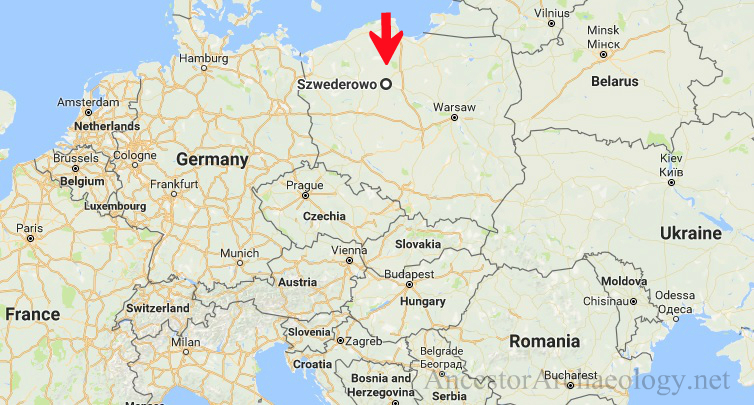 As you can see, their home today sits smack dab in the center of Poland. Perhaps further research into Catholic church records in Poland might uncover additional information. If those records still exist. Here is the intake list. 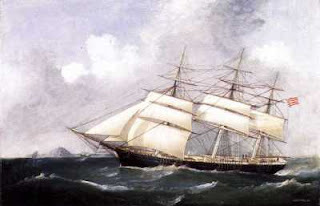 Their arrival into the port of New York 34 days later. September 9th 1868. The next time we see Anton is in the Chicago City Directory for the year 1870. Anton would have to have been in Chicago in 1869 to make the 1870 edition of the printed directory. Travel from New York to Chicago by train would have been possible in 1869, but would it have been too costly for this family of 8? Water travel was also common, and quite likely, the Erie canal to the Great Lakes offered affordable westward travel. At any rate, by 1870 Anton and family were tucked into their new American home on south Morgan in Chicago. Anton began his house-moving business and the family settled in. Less than two years in their new country the family witnessed a devastating tragedy, the Great Chicago Fire, which started not far from their doorstep and raged for several days. What panic must have this caused? Did they know people affected by the fire? We're they able to help, or did they just watch in fear and uncertainty? Fortunately they were spared and life went on. 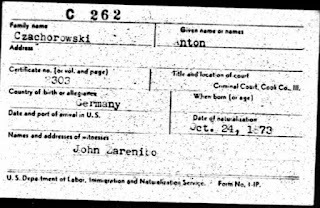 In 1872 Anton and Mary had their first American-born child. A daughter named Mary. In 1873 Anton petitioned the court for citizenship. Anton and Mary would have at least 3 more children in the decade between 1870 and 1880. And they would bury a few, too. Little Maria who came on the ship from Prussia died sometime before 1880, and more likely before daughter Mary was born in 1872. There was a daughter named Elizabeth who died in 1876, age unspecified, but she was not on the passenger list so I presume she was born in Chicago. The couple buried a daughter named Julia in 1881, she was 5 years old. And in 1887 their oldest daughter Paulina died. She was 22 years old. Sometime around 1880 the family moved from S. Morgan to Maxwell St. Weddings were celebrated on three occasions. Oldest son Frank was married in 1888, followed by second son Bernhard who married in 1892, and finally daughter Mary wed in 1893. 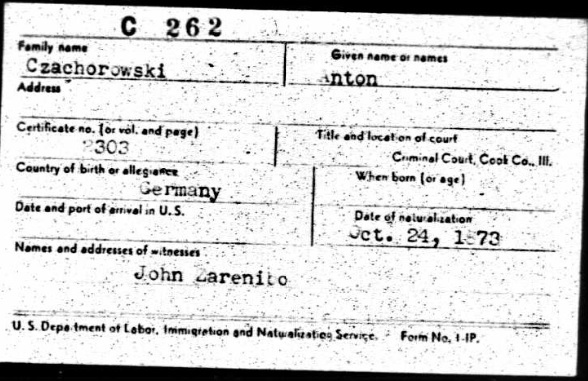 Anton consistently can be found in the City Directories, although he eluded the census takers his entire life. Not one time did he show up on a Federal census! By trade Anton was a house-mover, his sons Bernhard and Anton joining the family business when they became of age. Anton buried his wife on July 16th 1896. She was just 59 years old. Nine years later Anton sadly buried another one of his children. His son Anton who died January 17th 1905. Anton followed shortly thereafter. He left this earth March 12th 1908. He was 73 years old. Anton is buried in St Boniface Cemetery in Chicago with his wife, his children and his mother-in-law*, the graves are all unmarked except for Paulina. *After further study I have concluded that the older woman traveling with them from Prussia must certainly have been Maria's mother. She is buried in the family plot in St Boniface.